Amazon's newest ebook reader is arriving today on the doorsteps of the lucky few customers who got their orders in early, and for the rest it will be arriving either next week or next month. The Kindle Voyage got mixed reviews from the early reviewers, but even before those reviews came out this ereader was back-ordered on Amazon.com. The current expected ship date is some time in November, but that doesn't mean you have to wait days or weeks to get one. Don't tell anyone I told you, but the Kindle Voyage is in stock at Best Buy. A call to my local BB store confirmed what the website told me: the Voyage is in stock and can be bought today. Unfortunately, I don't think you'll be able to order one online; I tried several times and the website did not cooperate. But I do have confirmation that they're in stores. So will you get one? When the Voyage launched I was put off by the price, and I haven't been terribly impressed with the review unit which Amazon loaned to me, but if I were in the market I would check my local BB store. Best Buy doesn't have customer service half as good as Amazon's, but it does offer a 2 week return policy on ereaders. That's enough time to try the Voyage and return it if it doesn't suit you. P.S. Let me know if you get one. I'd like to know if I am the only one who had issues with the page turn buttons. I have one on order. If the page-turn button doesn’t work well for me, it will be going back. The estimated delivery date on mine is 10/31, up from 11/28 a few days ago. Someone said it feels like paper? Do you recall who? Whoever said that probably doesn’t know what they are talking about; while you could give glass the texture of paper that would ruin the screen clarity. Amazon claims it. However, it obviously really does not. It’s suppose to cut out glare while reading in direct sunlight. Yeah, it doesn’t feel like paper – not even close. I bought it at BB last night. The page turn sensor things are um… well… not that good. 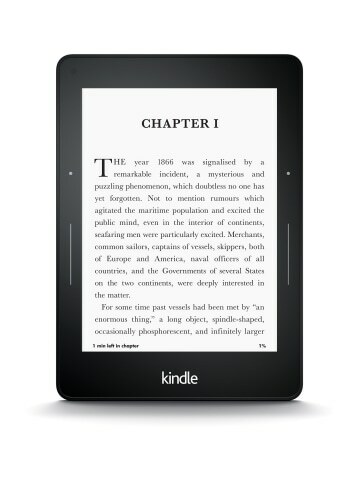 On the Kindle 4 basic and the Kindle 3, if I hit the button the screen would immediately change. Using these page turn things it’s more like: press, press harder, haptic feedback, pause, turn page. Much faster to just hit the screen. Real buttons would have been better. I hate the power button being on the back of the kindle. It’s just the worst. But the screen is amazing, as a quality of the glossy finish, flush bezel and higher resolution. Also the contrast is better than my PW2. Blacker blacks and whiter whites. In fact it has the best contrast out of all of my ereaders. The light sensor flaked out quickly and just stopped working. I think the only good reason to buy this device is the screen. Honestly while I love the screen, it actually looks to me only slightly better than the PW2. I think most people should just save their money. I can’t do anything about the light sensor, but there is an option in settings to get the page turn buttons to respond to less pressure. I received my Voyage yesterday and have had no issue with the PagePress. Technically they are not buttons. I love that I can advance a page from either side. However, if I am reading the Voyage while it is propped up, advancing using the screen is easier. Great versatility. I do find the screen higher res than the Paperwhite and actually LIKE the power button on the back. I sometimes fumble around for it on the Paperwhite and that is not the case with the Voyage. It is too bad that Amazon did not release the form factor to third party case makers earlier. Their own case (where the cover flips over the top) is not what a lot of us want; we prefer having the case open like a book. So it will take a while for a satisfactory case to be available. In the meantime, I have it in a sleeve and will be extra careful. I decided to wait a week before opining on my Voyage. Well, six days now. Days passed. The backlight gradient went away almost completely — I’m not sure I’d notice it at all if I hadn’t had the initial problem. It seemed to steadily improve its lighting consistency as the auto-adjuster did its thing, darker and brighter with conditions. It also improved in little bits on restarts, though we’re talking such small increments that I couldn’t swear to it. Another oddity: somehow my hands found comfortable positions in which to hold the Voyage and use the pagepress “buttons”. And the pressure required for accurate presses became automatic. I no longer notice I’m turning the pages that way. The Voyage’s mechanics have disappeared and nothing interferes with immersion. The first few days I was definitely sending it back for a refund. Now I’m keeping it. Happily so, especially after firing up my first-gen Paperwhite for the first time in a week and viewing the same ebook page side-by-side. WOW! What an incredible difference! I can’t go back, now. This kind of detail is exactly why I like to take a week before posting a review.